A beautiful 1855 first edition example of Colton's map of Australia. Like most of Colton's Australia maps, this map is derived from an earlier wall map of the world produced by Colton and D. Griffing Johnson. Colton's map covers the entire continent including Tasmania or Van Diemen's Land. Colton's mappings of Australia, updated annually through the 1860s, offer a comprehensive overview of the exploration of the continent's interior. This example depicts the continent with good detail along the coast and a largely unexplored interior. Colton notes Stuart's Farthest Point, Torrens Basin, the Stony Desert, Traveler's Valley, a few rivers, and little else in the vast and desolate continental interior. Tables in the corners show references to various counties in each province. A smaller table in the lower left provides a time line for the exploration of the continent, noting the dates associated with important navigators including Tasman, Arnhem, Hartog, edel, Flinders, and others. Where known, the map also identifies various cities, towns, rivers, mountains, and an assortment of additional topographical details. 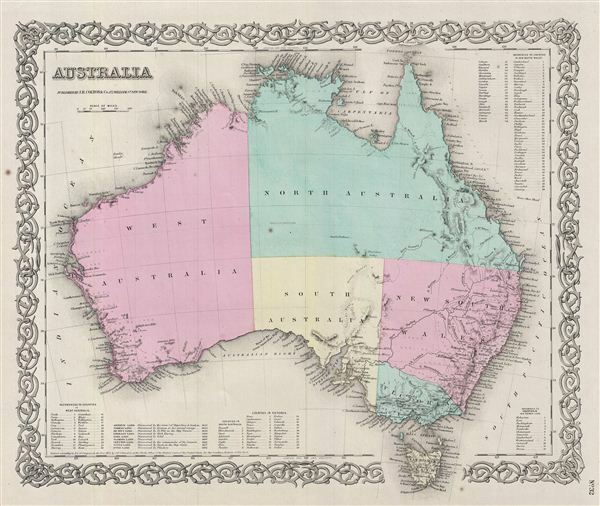 Map is hand colored in pink, green, yellow and blue pastels to define the provincial divisions of North Australia, West Australia, South Australia, New South Wales, Victoria and Van Diemen Land. Surrounded by Colton's typical spiral motif border. Dated and copyrighted to J. H. Colton, 1855. Published from Colton's 172 William Street Office in New York City. Issued as page no. 32 in volume 2 of Colton's 1856 Atlas of the World.